The great kids game is again tarnished. The very rich think they can do what they will. Now can we do something with other New York scammers and criminals, Jamie Dimon, Lloyd Blankfein, etc? 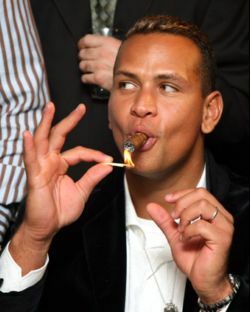 Not to excuse Alex Rodriguez, but they make him look like a choir boy. Professor Freud and M. Emile Coue have both pointed out, in similar language, despite their different techniques, the same fact about the identity of fear and fascination. It is a commonplace in the daily observation of the practicing psychologist. As soon as an obstacle is realized as such, we make frantic efforts to avoid it, with the result that we bump into it. Psychical impotence is in the experience of most men; it is the same thing in terms of another problem. Now the present craze for taking “habit-forming drugs” (so-called), and the suggested remedies, are closely bound up with this curious phenomenon. The will behaves like a mule, and the imagination like a bird in the presence of a serpent. In the spring of 1914 I had occasion to study the effects of cocaine. As it happened, I had access to all the “fast” or “Bohemian” sets in London. I went through them with a tooth-comb, and in three months managed to discover two girls who were indulging in that drug to a deleterious extent. Today, one might almost say that no tea-party is complete without it. My investigations were cut short by the war; I was obliged to return to the United States. I had therefore no opportunity of observing the cause of the change. My English colleagues, however, attribute the present situation to two main factors: (a) the widespread outbreak of psychoses and neuroses due to public anxiety and stress, and the consequent demand for something that would dull the nerves; and (b) the D.O.R.A. restrictions on the sale of liquor. I agree that both these factors were potent; they square with our own experience in America. There drug-habits have been common for many years; for the people of the United States are naturally afflicted with the nervous diathesis. This is due partly to the climate, which is electrically charged in a way which Europeans cannot possibly understand until they have tried it, and partly to the fact that education is so widespread that the people demand art, literature, and music, which things are denied to them by the benevolence of the spiritual heirs of Cotton Mather. 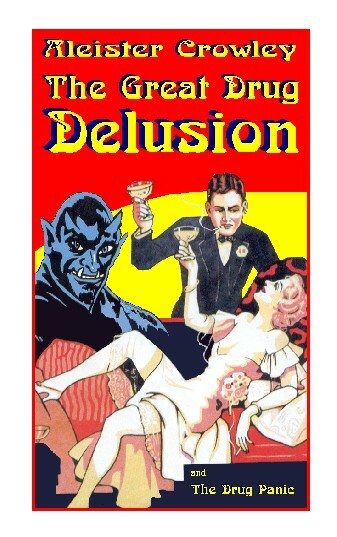 No other hypothesis even attempts to explain the Yellow Press, the dancing manias, the crazed search for amusement — and the resort to the waters of Lethe, beginning with cocktails and ending with cocaine. But prohibition, ineffective as it is, has intensified the demand for drugs; and I am therefore ready to believe that war-time restrictions on the sale of liquor produced a parallel result in England. I note in passing that the prohibition of absinthe in France has resulted in the manufacture of substitutes, some of which will actually eat their way through a marble table. There is, however, a third factor to be considered; and, without going over frankly to the theories of Nancy, the Salpetriere, Vienna, and Zurich, it may well be that it is the most important of all. This factor is the nauseating form of publicity given by the newspapers — some even of those which should know better — to the matter. Indulgence in drugs is described with an unholy leer; it is connected lewdly with sexual aberrations; and the reprobation with which the writers smear their nastiness is obviously hypocrisy of the most oily and venal type. The object is to sell the paper by making people’s flesh creep, like the Fat Boy in Pickwick. Now there is in such articles — which began, I regret to say, with a not uninteresting novel called Felix, by Mr. Robert Hichens — what Baudouin calls a pernicious suggestion. The reader is invited to gloat on the forbidden fruit. But even worse, from this point of view, is the unanimous assertion that once anybody starts to take a “drug” he cannot possibly stop of his own free will, and is only to be rescued at the cost of unutterable torments. Medical treatises on the subject, with no exception so far as I know, perpetuate this wicked libel on the divine prerogative of man to do what he wills, and, when he wills, to stop doing. Writers of fiction follow the evil precedent. The exception to this rule is The Hasheesh Eater, by H. G. Ludlow, in which the author (who lived on the Hudson near Poughkeepsie) describes his addiction to that drug, and his cure by his unaided determination. Such cases are, however, common enough; but the strong-minded never reach the clinic of the physician, and are consequently ignored by him. 2. Enslaved by anything that appeals to them. 3. Able to use anything without damaging themselves. I hesitate to admit either of the two former classes to the title of Freeman. Since the year of 1898 I have been principally occupied in studying the effects of various drugs upon the human organism, with special reference to the parallelisms between the psychical phenomena of drug-neuroses, insanities, and mystical illuminations. The main object has been to see whether it is possible to produce the indubitably useful (see William James, Varieties of Religious Experience) results of “ecstasy” in the laboratory. In pursuit of this laudable aim, I attempted to produce a “drug-habit” in myself. In vain. My wife literally nagged me about it: “Don’t go out without your cocaine, sweetheart!” or “Did you remember to take your heroin before lunch, big boy?” I reached the stage where one takes a sniff of cocaine every five minutes or so all day long; but though I obtained definitely toxic results, I was always able to abandon the drug without a pang. These experiments simply confirmed the conclusion which I had already adopted, provisionally, on theoretical grounds: that busy people, interested in life and in their work, simply cannot find the time to keep on with a drug. As Baudelaire says: A perfect debauch requires perfect leisure. A prominent newspaper correspondent of my acquaintance has actually reached a stage where the privation of opium was torture to him. The stress of the war threw additional work on him; but instead of accentuating his need, it made it impossible for him to find the time to smoke. “Satan finds some mischief still for idle hands to do” is sound psychology. A colleague of my own, who participated in my experiments, found himself on several occasions “in the clutches of the drug-fiends.” But those occasions were all characterized by one fact: he was, for external reasons, at a deadlock with his work. He had nothing to do but to think about the drug, and his mind was so flooded with “pernicious suggestions” that he could not stop it. Every trifling malaise was unhesitatingly attributed either to the effects of the drug or those of trying to stop it! Just so the young man who was reading Middlemarch fell down stairs and broke his leg — and blamed the law of gravity instead of George Eliot! It is not contended here that the physiological theory of “toleration” is untrue. No doubt the nerves do, more or less, “shriek for their accustomed stimulus,” as the foolish physician usually tells his victim — apparently with the hope of removing any traces of self-confidence or will-power that he may possess. But, within limits, an average brave and resolute man can arrange the details of his “cure,” and carry them out with success. Now if there be one thing certain in this complex world it is this: that moral maladies require moral therapeutics. The present system of “per nicious suggestion,” backed by prohibition, which insults the free will and dignity of mankind, which offers princely opportunities to illicit traffic and blackmail, makes the situation worse every month. In Harlem, a district of New York corresponding roughly to a combination of Bayswater and Brixton, there are, by police statistics, over 17,000 school children addicted to heroin. In this particular case the cause is simple enough. An enterprising firm of doubtless God-fearing chemical manufacturers sent out agents to distribute the drug gratis to the children. Having established the “habit,” the agents next demanded an ever-increasing price, and when they had extracted the last mil from the tortured innocents, told them to steal, rob, and murder in order to get the “mazuma” for the “dope.” (The “addict” is notoriously fertile in expedients for obtaining supplies of his drug.) Abominations of this sort are only possible when the course of nature is violently diverted by pious Puritans and profiteering policemen. Nobody troubled about the heroin when is was almost as easy and as cheap to buy as butter. Today, despite repressive legislation, there is an international industry making its many thousands per cent on an enormous turnover, and occasionally throwing some peddling Jonah overboard when some brainless dancing girl happens to kill herself. There has been so much delirious nonsense written about drugs that sane men may well despair of seeing the light. But it ought to be obvious that if England reverted to pre-war conditions, when any responsible person (by signing his name in a book) could buy drugs at a fair profit on cost price, cocaine (say) at 16's" and heroin at 20's" the bottle of 10 grammes — instead of as many pounds — the whole underground traffic would disappear like a bad dream. It is possible, perhaps even probable, that for a month or two there would be an increase in the number of fools who killed themselves in their folly, though personally I doubt it. But I have no shame in saying that, after a war in which we sent our sturdiest sons as sheep to the slaughter, we should not miss a few score wasters too stupid to know when to stop. Besides this, we see, on the one hand, that the people who want the drugs manage to get them in one way or another, at the cost of time, trouble, and money which might be used more wisely, and on the other that the infernal suggestions of the Press, and the vile venality of the villains attracted to the traffic by the immense profits, are deliberately creating new addicts every day of people who in the normal course of affairs would no more think of indulging in narcotics than a cat in a cold bath. So much for the purely practical points of the position; but, deeper still, let me say, as a Jeffersonian democrat, that I dread beyond all else the growth of the petty tyranny of restrictive legislation, the transference of disciplinary authority from the judiciary to the constabulary, the abandonment of every constitutional safeguard of individual liberty, the division of the people into the hunters and the hunted, the exaltation of the spy, the “agent provocateur,” and the blackmailer, the open adoption of the policy of sitting on the safety-valve, and the degradation of citizenship by applying physical repression to the evils whose only redress lies in moral development! Great stuff. Such wisdom existed back then that it puts today's pretentious intellectuals to shame. How do you become 'wise' ? By adding 'vice,' that's why you seek the ad-vice of the wise, right ? Wise = vice with two mirrored v's and a 'c' that has mirrored itself backwards to form an 's,' or can 'c' or 'see' front and back simultaneously. In other words, a 'vice' that has learned to contemplate and temper itself, as if looked at in a mirror, is the fire that formerly burned, now giving warmth, but which would not be warmth but for the burning. I will try and take your advice to ad-vice as necessary. In moderation of course. A well liked local man - gave to several churches and charities, land preservationist, always helping his neighbors - got his land taken by the feds for doing the same things elements of the feds are involved in, growing and importing dope. It is now the the Headwaters Wildlife Management Area. Last year a landowner adjoining this property had loggers clear cut the timber on his part of the mountain. It was what one noticed taking the road to the top. We've had so much rain this year that it has been growing back fast in scrub. It's ugly but sort of funny too. The top of the mountain is also a cell tower farm. Allegedly the 2nd highest point there is from the Smokies to the Rockies. Actually an incredible place with a wild history. The chief of the likhtsamisyu says no oil pipelines across his land. They decided to run one to Nova Scotia. Guess where they put the tar coke …. yeah you guessed it, Detroit. When they want to kill a town they go all out. The coke sands blew into Windsor during a storm. Bad bad stuff. The Koch coke. Detroit's a dumping ground for toxic waste but somewhere there's a profit. Natives win or eminent domain? Maybe the Wet'suwet'en are opposed to the pipeline at the moment. Actually there are a couple of different ones. If you go to the link, note the last sentence. "Wet'suwet'en territory, Broman Lake, BC. Today at a community members meeting, W... First Nation will celebrate the conclusion of a win/win community investment agreement with Huckleberry Mines. Other issues regarding Huckleberry's use of hydro lines and a forest road crossing Felix George Indian Reserve #7 have also been successfully resolved. Chief Karen Ogen, July 24, 2013." There is always more than meets the headline, I mean the eye. "An open letter from Roger Waters"